* Wash or shower after canoeing. * Cover minor cuts and scratches with waterproof plasters before getting in your boat. * Always wash your hands and face before eating. * Wear trainers or wet suit boots to avoid cutting your feet. The effects of cold, brought on by wind and cold water cannot be underestimated. Because canoeing is a wet sport, and even more so in the UK where white water canoeing is a winter sport, hypothermia is a real and regular risk. Wind chill on a wet person can bring on hypothermia extremely quickly. Always be aware of the risk and take adequate precautions, particularly after a capsize. Wear appropriate clothing. Learn the signs so you can recognise it in others. 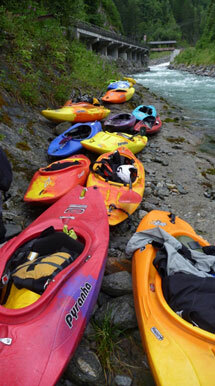 Canoes, in particular when full of water, are very heavy. Basic correct lifting techniques should be used at all times - ask for assistance and be careful in windy conditions, e.g. when loading onto car roof racks. Take care not to drop heavy items such as canoes. Weil’s Disease or leptospirosis icterohaemorrhagia to give it its full title is an infection carried in rat’s urine, which can contaminate water and wet river banks. The bacteria that cause it do not survive long in dry conditions. It can be present in any water, including fast flowing streams and rivers, but the risk of infection is greatest in slow moving and stagnant water. Absorbing bacteria through the skin and mucous membranes of the mouth and eyes contracts it. The bacteria can also enter your bloodstream through cuts on your skin, particularly the feet, and if you capsize or roll your canoe. Thankfully Weil’s disease is rare, but it can be a very serious illness requiring treatment in hospital and it can lead to kidney or liver failure. The disease is a notifiable illness. If you become ill within a three to 19 day period after canoeing then you should see your doctor immediately. The most common symptoms are: temperature, flu-like illness, joint and muscle pain, often particularly noticeable in the calf muscles. Tell your doctor that you have been canoeing and where. Quick treatment with antibiotics is essential and make sure you receive a blood test. An ‘ELISA’ test at the local laboratory can normally give a result within a few hours. Avoid capsize drill or ‘rolling’ in stagnant or slow moving water, particularly where rat infestation is obvious. If you have flu like symptoms after canoeing go to your GP and tell him you are a canoeist. Note - your GP may be sceptical as their experience of Weil’s disease may only be with sewage and drain workers. For more detail open this guide to Weil's Disease. Tetanus is prevalent in many areas of the country, (in the soil). It can enter through cuts and scratches. Ensure you are up to date with your anti-tetanus booster injections. Cover all cuts, scratches and skin abrasions with waterproof plasters. Avoid it if possible. Wash after canoeing, in particular before eating. Generally only found in stagnant or static water in Summer. In the case of blue-green algae, if it is known to be present in a stretch of water, then avoid it until it is declared clear. This is necessary normally only for a short time whilst the algae blooms, but follow the advice of the local authorities. Never over extend the shoulder joint by stretching too far when doing strokes such as support strokes, eskimo rolls, etc. Always keep your elbow bent in these situations. When being “trashed” by extreme white water or heavy surf, keep feathering the blade to ease the water pressure and relieve the stress on your shoulder joint. Take care on wet, slippery or loose soil on river banks. It is easy to overbalance and fall either injuring oneself, damaging equipment or falling into the river. White Water Canoeing in the UK often takes place when snow and ice or wet slippery mud are around. Take extra care! If you capsize a lot in cold water, (e.g. whilst playboating or surfing), you may develop surfers ear. Frequent cold water immersion can lead to bone growth in the ear canal. This can cause the ear canal to close partially or completely, resulting in ear infections and deafness. Severe cases may require surgery, which can result in permanent partial deafness. If you playboat it is essential that you use earplugs to protect you ears. Prevention is best option!